En este artículo, presentamos los resultados de un proyecto que consiste en una aplicación móvil con comunicaciones mediante tecnología Bluetooth, debido a que en contextos académicos estamos interesados en el uso de esta tecnología porque es fácilmente incorporable en escenarios académicos, donde los estudiantes son los principales participantes y puede ser ampliamente usado. Adicionalmente, después de hacer una revisión de los lenguajes y tecnologías para desarrollo de dispositivos móviles, consideramos que para este tipo de proyectos la plataforma J2ME (Java Platform Micro Edition) es muy apropiada. Este proyecto permite la creación de redes móviles PAN (Personal Area Network) usando la plataforma J2ME, en la cual podemos controlar la trazabilidad de la información y la conexión y desconexión de cliente móviles sin afectar la comunicación. Para lograr este tipo de comunicación, hemos tomado como caso de estudio el juego “BlackJack”, con el fin de manejar la conexión y desconexión de clientes en una forma consistente y segura. In this paper, we present the results of a project that consists of a mobile application with communication through Bluetooth technology, due to in academic context we are interested in using this technology because it is easily incorporable in academic scenarios where students are the main participants and it can be widely used. Additionally, after doing a review of the languages and available technologies for mobile devices development, we consider that for this type of projects the platform J2ME (Java Platform Micro Edition) is very appropriate. This project allows the creation of mobile networks PAN (Personal Area Network) using the platform J2ME, which we can control the traceability of the information and the connection and disconnection of mobile clients without affecting the communication. To achieve this type of communication, we have taken as case study the game "BlackJack", in order to carry out the clients’ connection and disconnection with a consistent and safe way. N. Golmie. “Bluetooth Dynamic Scheduling and Interference Mitigation”. Mobile Networks and Applications. 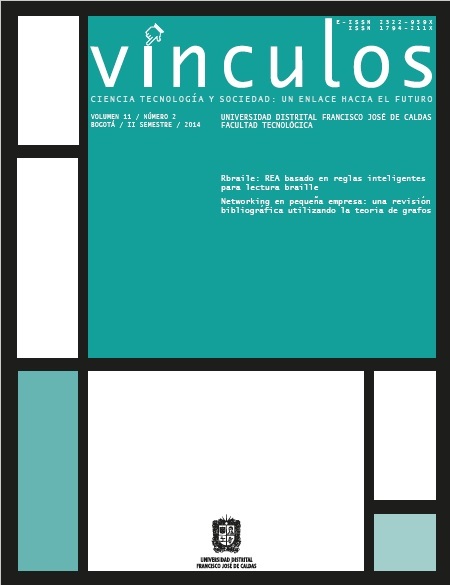 vol 9, issue 1. pp 21 – 31. 2004. Java Card Technology. [on line] available in: http://www.oracle.com/technetwork/java/embedded/javacard/overview/index.html. Date consulted: August 20th 2013. Java Platform, Micro Edition (Java ME). [on line] available in: http://www.oracle.com/technetwork/java/embedded/javame/index.html. Date consulted: August 20th 2013. Sun Java Wireless Toolkit for CLDC. [on line] available in: http://www.oracle.com/technetwork/java/sjwtoolkit-138075.html. Date consulted: September 15th 2013.
http://www.oracle.com/technetwork/java/javame/about-java-me-395899.html. Date consulted: September 15th 2013. André N. Klingsheim. “J2ME Bluethooth Programming”. www.oracle.com/technetwork/java/overview-138293.html. Date consulted: September 15th 2013. J. Joya y H. Florez, Communication of mobile devices through bluetooth technology, rvin, vol. 11, n.º 2, pp. 92-98, dic. 2014.